The .zip file includes four individual images, one for each set seen, at a printable scale suitable for creating Blythe eyechips (14mm). ALL IMAGES ARE PNG FORMAT at a crisp high resolution (300 dpi). If you require a different format please contact me and I am happy to accommodate and create a custom listing for you. Please print at actual scale--do not scale to page. Results are best on glossy photo paper at the highest quality. The chips in the photographs were printed at a local Kinko's with great results! Individual sets are available in my other listings, but you get a discount by purchasing all four Series Four sets at once! Please carefully examine the preview image to confirm exactly what you will receive. ANDROID: Minimal ombre irises with pale pupils for a subtle look. BATIK: A splash of bright and unexpected colors in a vibrant sunburst style. MYSTIC: Drifting clouds and mysterious lights for otherworldly dolls. SHOUJO: Anime-inspired eyes for magical girls and cartoon aesthetics. 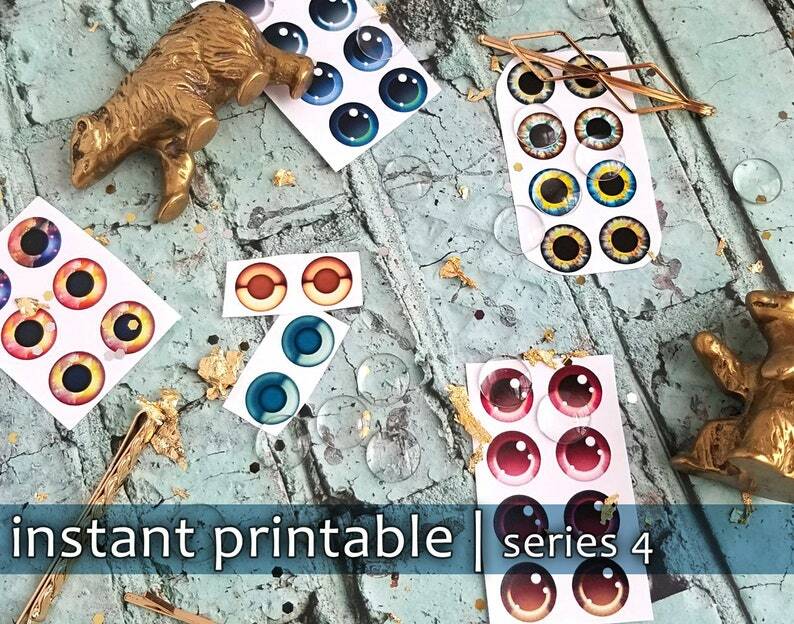 Some eyes in the Series Four collection were handcrafted from properly licensed photography manipulated, layered, adjusted, and recolored by myself. The rest are made entirely of original artwork. super kind seller and beautiful designs too! thank you for the gifts!! ur extremely talented and i wish u luck with ur business! !